We are experienced in providing IT Support Services in Costa Mesa for various business sectors, customizing our services to suit the specific industry needs of our customers. At TechHeights we offer best-in-class IT support solutions for businesses in Costa Mesa. We are a one stop shop for all your IT needs. We specialize in managing all your IT requirements, be it setting up an IT Infrastructure from scratch, re-engineering your Network, upgrading Servers or managing workstations and printers. Our Costa Mesa IT Support team is local and can provide same day support. We start by performing a comprehensive IT audit and advise on how to make the most of it without breaking the bank. We work proactively to resolve all IT issues so that your staff can work efficiently. If your business accepts, stores, transmits credit card data, or stores medical records then PCI, DSS and HIPAA compliance certifications are mandatory. We at TechHeights can help you reach compliance and increase data security. Can you Imagine losing your business critical data? To prevent such situations, TechHeights can help you devise a data recovery system or a complete Disaster Recovery solution that will protect your data / applications and retrieve it if lost for any reason. Ever thought of consolidating or reducing your IT hardware burden? TechHeights can help you migrate your existing infrastructure to a cloud based solution so that you can get to your applications and data from anywhere at anytime. Our Microsoft, VMware and Cisco certified team allows you to leverage best practices in deploying Cloud and On-premise solutions. Fixed Cost, Flexible Plans & Great IT Support in Newport Beach. TechHeights offers the highest quality and best value IT Support outsourcing options for businesses throughout Costa Mesa, Orange and Riverside County. Our certified team, responsive customer service, combined with our coverage deliver an unmatched IT support solution. 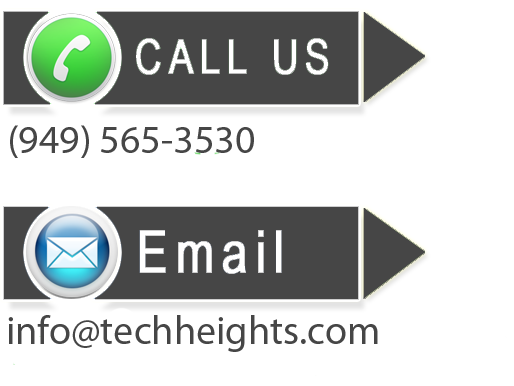 We have been in business since 2007 so you can rest assured that we will be here when you call. Our Goal is to build long term relationship with our clients so that we can be your one point of contact for all your IT Support needs. No two businesses are alike, and no two businesses have the same IT services requirements. We at TechHeights understand that and so have designed IT support plans that are flexible enough to meet any support need. TechHeights acts as an extension of your business and making sure that “IT WORKS”, allowing you to be more productive while reducing your operating costs. Our IT consulting in Costa Mesa is geared towards small and medium businesses that require Enterprise level IT support services at small business budget. TechHeights will evaluate your immediate and future IT Support needs. With a roadmap in mind, we help deploy IT solutions that support company’s growth without disrupting the existing network. I cannot be more thankful that I was introduced to Techheights. Between the server setup and office configurations that were needed to be done I was completely overwhelmed. I cannot stress enough how helpful, professional and knowledgable these guys are. They assisted me in the office as well as from offsite even at odd and weekend hours. They are and always will remain on my speed dial! My experience with these guys has been great. Fast responses and they are always friendly. They moved our server and set up remote connections. We have called on numerous occasions and have always been very knowledgable and helpful. I would definitely recommend them! Was looking for a company to help me set up my website. With all the ad’s from different website company’s & assurances of making mine one of the best, I found Techeights the most sincere, efficient & very helpful. Cool guys & took the effort to understand my business with making suggestions that I was very pleased with. Extremely satisfied with the outcome & would DEFINITELY recommend these guys. Way to go Techeights !!! John Subbiondo, Director of Finance & Operations, Lombard Consulting Services Inc.
restored our backup, and got us back on our feet with zero data-loss The system has been working perfectly ever since, and he saved us thousands of dollar of potentially unsuccessful repair efforts on the old machine and additional down time. Shuchipan and his team is extremely easy to work with – they have deep IT knowledge, understands issues quickly, is an objective and logical problem solver, and generously shares his knowledge. I would recommend TechHeights highly to anyone.